Immune from Lyon in France are certainly not making it easy for their first time listeners. Their self-produced seven song EP was recorded on a digital eight track machine, and already their influences tell you that they play the kind of music you can as well rehearse in your bedroom, as complaints from neighbours are more than unlikely. The first time I thought that I wasn't listening correctly, but then decided on pumping the volume up. 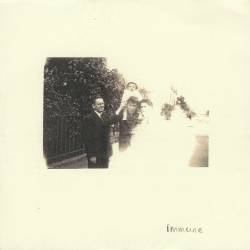 Immune are not a rock band, and apart from decent programmed rhythm tracks, there is nothing here to get you dancing. Boring at first, the album is also very demanding, and their take at music, somewhere between Sigur Ros with testosterone and a more electronic latter day Talk Talk, is anything but mass compatible. These days there are more and more people experiencing with quiet sounds, preferring atmosphere over music, but Immune never let if drift off into a mere formal exercise. Their songs are short and concise mostly, but even on longer structures, like on the six minute closer Father's Falling, they manage to catch the frail beauty of post rock, to bend it into something very dreamy. If you feel scared away by the not too great English at the band's homepage, don't worry, because the vocalist does an excellent job, drawling his lyrics in a lazy way that would make Mark Hollis proud of him. This sleepy narrative is the ideal backdrop for the semi-acoustic, semi-electronic music, which excels on both levels, hiding so many details in the final mix that every time you listen again you are sure to discover something new. The keyboards have an ethereal quality, the piano is pure weeping sadness, the sparse electric guitar adds colour,... There's just so much happening on this apparently silent CD that this paradox alone should already be enough to prove the budging genius of Immune. This is very sad music, not astonishing considering that these guys are all strongly into Matt Elliot, and probably not the best way to start your way into Spring. But apart from seasonal complications, the safe-handed delivery on this debut EP leaves you wanting for more. Until then, you should well spend 8 Euros on this promising debut.